Pioneers in the industry, we offer duct ventilation system and school/ hostel central air cooling unit from India. Being an eminent name in manufacturing, exporting and supplying, we are engaged in offering Duct Ventilation System. This ventilation system is high on demand in the industry for its least maintenance. 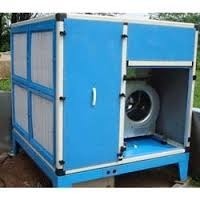 Our provided ventilation system is obtainable in varied specifications as per the variegated needs of customers. This ventilation system is developed from the optimum quality components and cutting-edge technology in accordance with the norms of industry.